October 11, 2016 – Researchers from the University of New Hampshire have captured unique measurements of the Van Allen radiation belts, which circle the Earth, during an extremely rare solar wind event. The findings, which have never been reported before, may be helpful in protecting orbiting telecommunication and navigational satellites, and possibly future astronauts, by helping to more accurately predict space conditions near Earth, as well as around more remote planets. 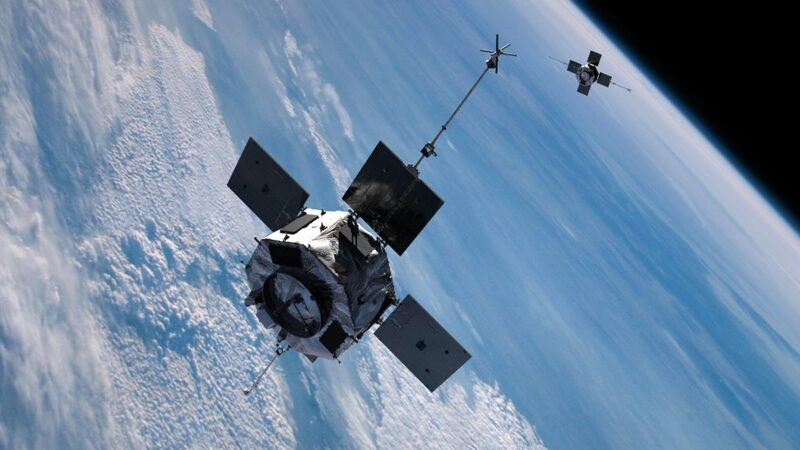 The UNH researchers used data from more than 10 spacecrafts, including information from a UNH-led instrument on board NASA’s Van Allen Probes twin satellites, to get measurements of both the Earth’s inner and outer Van Allen radiation belts, two donut-shaped regions of high-energy particles trapped by Earth’s magnetic field, during the uncommon solar wind conditions. The results revealed valuable information of unexpected and dramatic changes in the radiation belts allowing scientists to explore the effect of similar conditions around other Earth-like planets at other stars. Earth is embedded in the always-expanding atmosphere of the sun, called the solar wind, which blows past planets to the edge of the solar system. Typically, the solar wind is supersonic, faster than the speed of sound. When the solar wind encounters planets, like Earth, a shock wave is created that slows the wind down and deflects it around the planet. However, during the unusual episode, which was caused by the passage of a solar eruption over Earth, the data recorded by the researchers showed the solar wind became subsonic, or slower than the speed of sound. During this interval is when the researchers recorded measurements of the Van Allen radiations belts, and found that the outer belt was not as calm as expected. Two unusual phenomena occurred; a long-lasting electron drop in the Earth’s radiation belts and large oscillations in the magnetic field. When the Van Allen belts were first discovered in the 1950s they were thought to be relatively stable structures, but subsequent observations have shown they are dynamic and mysterious. Unlocking these mysteries could be valuable for newer technologies like telecommunication and GPS satellites which spend most of their time in the Van Allen belts. The Johns Hopkins Applied Physics Laboratory in Laurel, Maryland, built and operates the Van Allen Probes for NASA’s Heliophysics Division in the Science Mission Directorate. The Van Allen Probes are the second mission in NASA’s Living With a Star program, an initiative managed by Goddard and focused on aspects of the sun-Earth system that directly affect human lives and society. The Laboratory for Atmospheric and Space Physics (LASP) in Boulder, Colorado, provided two key instruments for the Van Allen Probes mission.